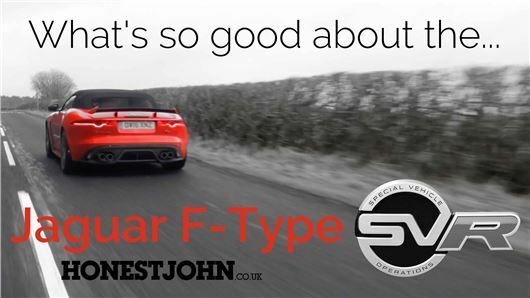 VIDEO: What's so good about the... Jaguar F-Type SVR? Jaguar takes making very fast cars very seriously these days - so seriously that it's recently setup a special department specifically for that purpose. The latest fruit of that department is the Jaguar F-Type SVR, a £100,000+ British muscle car with more horsepower than any road-going Jaguar ever. And more noise. Here's the video, and it's something a little different to what we normally do. We hope you enjoy it. Absolutely love the Jag F-Type SVR vid. A brilliant car with spirit and style. Reviewed in British 'off-beat' fashion. Fantastic. 115 grand for a noisy, boy-racer machine. Is there some point to this, when the roads are littered with other vehicles, and full of pot holes. Last great car they made was the 'E' type. Are there many safety features? I didn't hear about any. Thanks very much Jon - really appreciate the positive feedback. Engaging review, as always Mr Nicol, except for those perishingly inconsistent sound levels! Why?